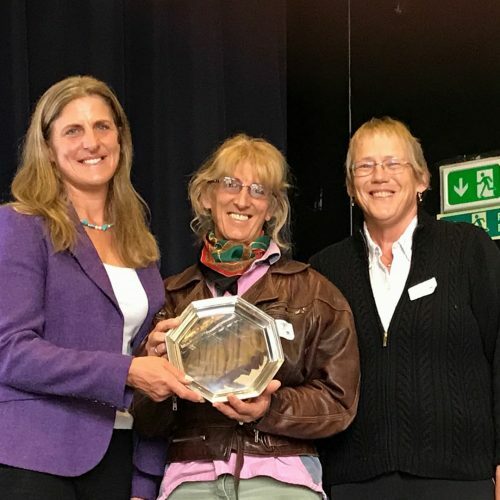 We were delighted when Lesley Morrill, our Chairman & Coach, was presented the Tora Bray Perpetual Trophy by Gilly Roper (the current holder) and Tina Cook (equestrian Olympian) at the RDA SE Regional Conference last week. The Trophy is awarded annually to a volunteer who has ‘gone the extra mile’ for RDA and Lesley certainly has done that! She held the post of RDA East Sussex County Coach for nearly twenty years, travelling many miles around the county supporting Groups with any queries over horses – their suitability, training, welfare – and Group coaches – their training and continued competence, something she is still involved with as an RDA Training Advisor. 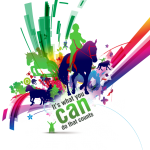 In addition Lesley has also been involved with Hope in the Valley for many years – coaching our riders, training and looking after Group ponies, preparing and transporting them for our weekly sessions and to competitions and events. Lesley is a Group Trustee and has been our Chairman for the past 13 years, ensuring that the Group continues to achieve its aims and objectives. She has been involved in many a fund raising event – walking up Mount Toubkal in Morocco and completing the UK Three Peaks Challenge to name but two. Although Lesley works full time for Roedean School as a Librarian and Bursar’s Assistant, she is currently running marathons in her ‘spare’ time!! Oh and she has just become a Granny …. ! At the same Conference Margaret Fogg was presented a 35 year Service Award! What an amazing length of time to give to the Group. Over all these years Margaret has looked after Group ponies, preparing and transporting them to weekly sessions, competitions and events as well as helping our riders in the arena, at events and on our Welsh holidays. She has also been a Group Trustee for many years and was our Pony Manager, before Nicola Cramond, organising and assessing ponies and ensuring their welfare. In addition Margaret has hosted picnic rides at her home. She currently cares for Toby and also supports Nicola with pony welfare. A truly dedicated volunteer!